I’m now in the fourth year study in Geology pursuing my Four Year Honours Bachelor of Science degree. I received the Christopher Riley Memorial Scholarship for the highest standing in second and again for the highest standing in third year geology. As well, I was awarded a Brandon University International Undergraduate Student Scholarship and the Nexen Chemicals Scholarship in Environmental Science. I was born in Luoyang, Henan, China where I spent most of my previous life. 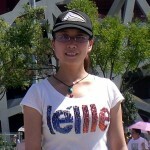 I came to BU in September 2006 after graduating from high school in China. When I first came into BU, I was taking Environmental Science as my major. After I took some first-year geology courses, I found Geology is a really interesting kind of science and it’s very practical. So Ichanged my major to Geology. I don’t really know how to answer this question. My philosophy in life….may be just live happily and be responsible for myself without regrets. If everything works out nicely, I think I will work somewhere in Canada as a geologist after my graduation in BU. Lei Xue is an A plus student in her fourth year of a B.Sc. Geology honours degree at BU. She is writing her thesis on the Characterization of Gold Mineralization on Bison Gold’s Northern Manitoba Exploration Properties, a project partially support by a BU Outreach Grant. She has also worked as a teaching assistant in the Department of Geology and volunteered her time to others. In addition, to being a hard-working, dedicated student with both academic and practical abilities, she is a pleasure to work alongside.